CRYSTAL QUEST® Large Capacity Ultimate Pour Through Pitcher Filter provides clean, great-tasting water conveniently, waiting and chilled in your refrigerator. NOTE: Special fluoride removal & alkalizer cartridges now available for pitcher. 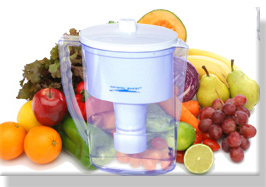 Other water filter pitcher brands cannot compare! 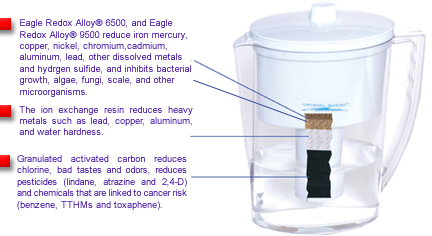 ~ CRYSTAL QUEST® Pitcher Water Filter is the only leading brand with 4 stages of filtration: Eagle Redox Alloy 6500, Eagle Redox Alloy 9500, Ion Exchange Resin & Granular Activated Carbon (GAC). ~ Large 8-12 cup pitcher purifier is perfect for entertaining or just for having plenty of delicious, chilled water available. ~ Slim, space-efficient shape fits neatly into refrigerator (9"L x 4"W x 11"H). 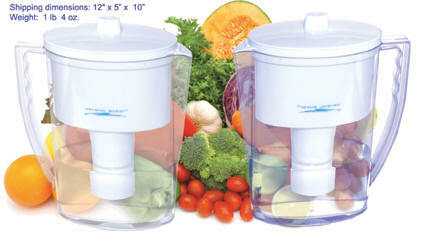 ~ Convenient flip-top lid for easy refilling, and handle designed for comfortable pouring. 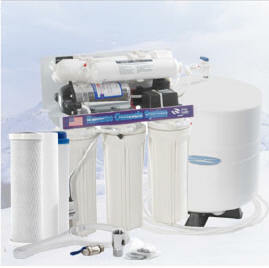 ~ Conveniently provides 2,000 gallons (6-12 months) of quality water. 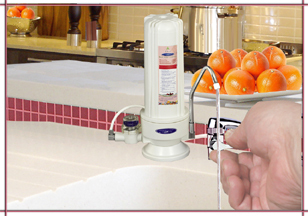 ~ Easy to take with you when you travel or as a camping water filter. 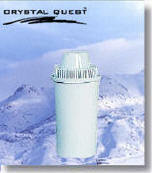 ~ Crucial for power outage or disaster as a survival water filter. ~ Available in attractive clear or blue. ~ Makes a great gift for birthdays, weddings, holidays. NOTE: Special cartridges for both fluoride removal and alkalizing are now available. Simply change cartridges and pour the water through again. Effectively removes most serious contaminants from water. Learn more about alkaline water. Contact us for orders outside the United States.